Change of wavelength caused by motion of the source. An animation illustrating how the Doppler effect causes a car engine or siren to sound higher in pitch when it is approaching than when it is receding. The pink circles represent sound waves. The Doppler effect (or the Doppler shift) is the change in frequency or wavelength of a wave in relation to an observer who is moving relative to the wave source. It is named after the Austrian physicist Christian Doppler, who described the phenomenon in 1842. The reason for the Doppler effect is that when the source of the waves is moving towards the observer, each successive wave crest is emitted from a position closer to the observer than the crest of the previous wave. Therefore, each wave takes slightly less time to reach the observer than the previous wave. Hence, the time between the arrival of successive wave crests at the observer is reduced, causing an increase in the frequency. While they are traveling, the distance between successive wave fronts is reduced, so the waves "bunch together". Conversely, if the source of waves is moving away from the observer, each wave is emitted from a position farther from the observer than the previous wave, so the arrival time between successive waves is increased, reducing the frequency. The distance between successive wave fronts is then increased, so the waves "spread out". For waves that propagate in a medium, such as sound waves, the velocity of the observer and of the source are relative to the medium in which the waves are transmitted. The total Doppler effect may therefore result from motion of the source, motion of the observer, or motion of the medium. Each of these effects is analyzed separately. For waves which do not require a medium, such as light or gravity in general relativity, only the relative difference in velocity between the observer and the source needs to be considered. is the velocity of the source relative to the medium; positive if the source is moving away from the receiver (and negative in the other direction). The frequency is decreased if either is moving away from the other. The above formula assumes that the source is either directly approaching or receding from the observer. If the source approaches the observer at an angle (but still with a constant velocity), the observed frequency that is first heard is higher than the object's emitted frequency. Thereafter, there is a monotonic decrease in the observed frequency as it gets closer to the observer, through equality when it is coming from a direction perpendicular to the relative motion (and was emitted at the point of closest approach; but when the wave is received, the source and observer will no longer be at their closest), and a continued monotonic decrease as it recedes from the observer. When the observer is very close to the path of the object, the transition from high to low frequency is very abrupt. When the observer is far from the path of the object, the transition from high to low frequency is gradual. is the velocity of the receiver relative to the source: it is positive when the source and the receiver are moving towards each other. Stationary sound source produces sound waves at a constant frequency f, and the wave-fronts propagate symmetrically away from the source at a constant speed c. The distance between wave-fronts is the wavelength. All observers will hear the same frequency, which will be equal to the actual frequency of the source where f = f0 . The same sound source is radiating sound waves at a constant frequency in the same medium. However, now the sound source is moving with a speed υs = 0.7 c. Since the source is moving, the centre of each new wavefront is now slightly displaced to the right. As a result, the wave-fronts begin to bunch up on the right side (in front of) and spread further apart on the left side (behind) of the source. An observer in front of the source will hear a higher frequency f = c + 0/c – 0.7c f0 = 3.33 f0 and an observer behind the source will hear a lower frequency f = c – 0/c + 0.7c f0 = 0.59 f0 . Now the source is moving at the speed of sound in the medium (υs = c). The wave fronts in front of the source are now all bunched up at the same point. As a result, an observer in front of the source will detect nothing until the source arrives where f = c + 0/c – c f0 = ∞ and an observer behind the source will hear a lower frequency f = c – 0/c + c f0 = 0.5 f0 . The sound source has now surpassed the speed of sound in the medium, and is traveling at 1.4 c. Since the source is moving faster than the sound waves it creates, it actually leads the advancing wavefront. The sound source will pass by a stationary observer before the observer hears the sound. As a result, an observer in front of the source will detect f = c + 0/c – 1.4c f0 = -2.5 f0 and an observer behind the source will hear a lower frequency f = c – 0/c + 1.4c f0 = 0.42 f0 . To understand what happens, consider the following analogy. Someone throws one ball every second at a man. Assume that balls travel with constant velocity. If the thrower is stationary, the man will receive one ball every second. However, if the thrower is moving towards the man, he will receive balls more frequently because the balls will be less spaced out. The inverse is true if the thrower is moving away from the man. So it is actually the wavelength which is affected; as a consequence, the received frequency is also affected. It may also be said that the velocity of the wave remains constant whereas wavelength changes; hence frequency also changes. These can be generalized into the equation that was presented in the previous section. An interesting effect was predicted by Lord Rayleigh in his classic book on sound: if the source is moving toward the observer at twice the speed of sound, a musical piece emitted by that source would be heard in correct time and tune, but backwards. The Doppler effect with sound is only clearly heard with objects moving at high speed, as change in frequency of musical tone involves a speed of around 40 meters per second, and smaller changes in frequency can easily be confused by changes in the amplitude of the sounds from moving emitters. Neil A Downie has demonstrated  how the Doppler effect can be made much more easily audible by using an ultrasonic (e.g. 40 kHz) emitter on the moving object. The observer then uses a heterodyne frequency converter, as used in many bat detectors, to listen to a band around 40 kHz. In this case, with the bat detector tuned to give frequency for the stationary emitter of 2000 Hz, the observer will perceive a frequency shift of a whole tone, 240 Hz, if the emitter travels at 2 meters per second. Sirens on passing emergency vehicles. The reason the siren slides is because it doesn't hit you. is the angle between the object's forward velocity and the line of sight from the object to the observer. The Doppler effect for electromagnetic waves such as light is of great use in astronomy and results in either a so-called redshift or blueshift. It has been used to measure the speed at which stars and galaxies are approaching or receding from us; that is, their radial velocities. This may be used to detect if an apparently single star is, in reality, a close binary, to measure the rotational speed of stars and galaxies, or to detect exoplanets. This redshift and blueshift happens on a very small scale. If an object is moving toward earth, there would not be a noticeable difference in visible light, to the unaided eye. Note that redshift is also used to measure the expansion of space, but that this is not truly a Doppler effect. Rather, redshifting due to the expansion of space is known as cosmological redshift, which can be derived purely from the Robertson-Walker metric under the formalism of General Relativity. Having said this, it also happens that there are detectable Doppler effects on cosmological scales, which, if incorrectly interpreted as cosmological in origin, lead to the observation of redshift-space distortions. The use of the Doppler effect for light in astronomy depends on our knowledge that the spectra of stars are not homogeneous. They exhibit absorption lines at well defined frequencies that are correlated with the energies required to excite electrons in various elements from one level to another. The Doppler effect is recognizable in the fact that the absorption lines are not always at the frequencies that are obtained from the spectrum of a stationary light source. Since blue light has a higher frequency than red light, the spectral lines of an approaching astronomical light source exhibit a blueshift and those of a receding astronomical light source exhibit a redshift. Among the nearby stars, the largest radial velocities with respect to the Sun are +308 km/s (BD-15°4041, also known as LHS 52, 81.7 light-years away) and −260 km/s (Woolley 9722, also known as Wolf 1106 and LHS 64, 78.2 light-years away). Positive radial velocity means the star is receding from the Sun, negative that it is approaching. The Doppler effect is used in some types of radar, to measure the velocity of detected objects. A radar beam is fired at a moving target — e.g. a motor car, as police use radar to detect speeding motorists — as it approaches or recedes from the radar source. Each successive radar wave has to travel farther to reach the car, before being reflected and re-detected near the source. As each wave has to move farther, the gap between each wave increases, increasing the wavelength. In some situations, the radar beam is fired at the moving car as it approaches, in which case each successive wave travels a lesser distance, decreasing the wavelength. In either situation, calculations from the Doppler effect accurately determine the car's velocity. Moreover, the proximity fuze, developed during World War II, relies upon Doppler radar to detonate explosives at the correct time, height, distance, etc. An echocardiogram can, within certain limits, produce an accurate assessment of the direction of blood flow and the velocity of blood and cardiac tissue at any arbitrary point using the Doppler effect. One of the limitations is that the ultrasound beam should be as parallel to the blood flow as possible. Velocity measurements allow assessment of cardiac valve areas and function, abnormal communications between the left and right side of the heart, leaking of blood through the valves (valvular regurgitation), and calculation of the cardiac output. Contrast-enhanced ultrasound using gas-filled microbubble contrast media can be used to improve velocity or other flow-related medical measurements. 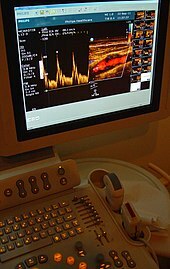 Velocity measurements of blood flow are also used in other fields of medical ultrasonography, such as obstetric ultrasonography and neurology. Velocity measurement of blood flow in arteries and veins based on Doppler effect is an effective tool for diagnosis of vascular problems like stenosis. Instruments such as the laser Doppler velocimeter (LDV), and acoustic Doppler velocimeter (ADV) have been developed to measure velocities in a fluid flow. The LDV emits a light beam and the ADV emits an ultrasonic acoustic burst, and measure the Doppler shift in wavelengths of reflections from particles moving with the flow. The actual flow is computed as a function of the water velocity and phase. This technique allows non-intrusive flow measurements, at high precision and high frequency. Developed originally for velocity measurements in medical applications (blood flow), Ultrasonic Doppler Velocimetry (UDV) can measure in real time complete velocity profile in almost any liquids containing particles in suspension such as dust, gas bubbles, emulsions. Flows can be pulsating, oscillating, laminar or turbulent, stationary or transient. This technique is fully non-invasive. = 750 km). Fixed ground station. is the driving direction with respect to the satellite. is the additional Doppler shift due to the satellite moving. Fast moving satellites can have a Doppler shift of dozens of kilohertz relative to a ground station. The speed, thus magnitude of Doppler effect, changes due to earth curvature. 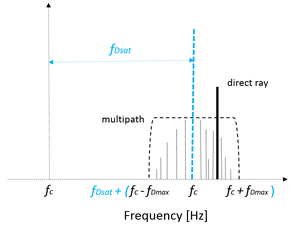 Dynamic Doppler compensation, where the frequency of a signal is changed progressively during transmission, is used so the satellite receives a constant frequency signal. is the relative speed of the satellite. The Leslie speaker, most commonly associated with and predominantly used with the famous Hammond organ, takes advantage of the Doppler effect by using an electric motor to rotate an acoustic horn around a loudspeaker, sending its sound in a circle. This results at the listener's ear in rapidly fluctuating frequencies of a keyboard note. A laser Doppler vibrometer (LDV) is a non-contact instrument for measuring vibration. The laser beam from the LDV is directed at the surface of interest, and the vibration amplitude and frequency are extracted from the Doppler shift of the laser beam frequency due to the motion of the surface. Since 1968 scientists such as Victor Veselago have speculated about the possibility of an inverse Doppler effect. The size of the Doppler shift depends on the refractive index of the medium a wave is traveling through. But some materials are capable of negative refraction, which should lead to a Doppler shift that works in a direction opposite that of a conventional Doppler shift. First experiment that detected this effect was conducted by Nigel Seddon and Trevor Bearpark in Bristol, United Kingdom in 2003. [p 6] Later inverse Doppler effect was observed in some inhomogeneous materials and predicted inside Vavilov–Cherenkov cone. ^ Buys Ballot (1845). "Akustische Versuche auf der Niederländischen Eisenbahn, nebst gelegentlichen Bemerkungen zur Theorie des Hrn. Prof. Doppler (in German)". Annalen der Physik und Chemie. 11 (11): 321–351. Bibcode:1845AnP...142..321B. doi:10.1002/andp.18451421102. ^ Fizeau: "Acoustique et optique". Lecture, Société Philomathique de Paris, 29 December 1848. According to Becker(pg. 109), this was never published, but recounted by M. Moigno(1850): "Répertoire d'optique moderne" (in French), vol 3. pp 1165–1203 and later in full by Fizeau, "Des effets du mouvement sur le ton des vibrations sonores et sur la longeur d'onde des rayons de lumière"; [Paris, 1870]. Annales de Chimie et de Physique, 19, 211–221. ^ Scott Russell, John (1848). "On certain effects produced on sound by the rapid motion of the observer". Report of the Eighteenth Meeting of the British Association for the Advancement of Science. 18 (7): 37–38. Retrieved 2008-07-08. ^ Petrescu, Florian Ion T (2015). "Improving Medical Imaging and Blood Flow Measurement by using a New Doppler Effect Relationship". American Journal of Engineering and Applied Sciences. 8 (4): 582–588. doi:10.3844/ajeassp.2015.582.588 – via Proquest. ^ Soroldoni, D.; Jörg, D. J.; Morelli, L. G.; Richmond, D. L.; Schindelin, J.; Jülicher, F.; Oates, A. C. (2014). "A Doppler Effect in Embryonic Pattern Formation". Science. 345 (6193): 222–225. Bibcode:2014Sci...345..222S. doi:10.1126/science.1253089. PMID 25013078. ^ Kozyrev, Alexander B.; van der Weide, Daniel W. (2005). "Explanation of the Inverse Doppler Effect Observed in Nonlinear Transmission Lines". Physical Review Letters. 94 (20): 203902. Bibcode:2005PhRvL..94t3902K. doi:10.1103/PhysRevLett.94.203902. PMID 16090248. ^ a b Giordano, Nicholas (2009). College Physics: Reasoning and Relationships. Cengage Learning. pp. 421–424. ISBN 978-0534424718. ^ a b Possel, Markus (2017). "Waves, motion and frequency: the Doppler effect". Einstein Online, Vol. 5. Max Planck Institute for Gravitational Physics, Potsdam, Germany. Retrieved September 4, 2017. ^ Henderson, Tom (2017). "The Doppler Effect – Lesson 3, Waves". Physics tutorial. The Physics Classroom. Retrieved September 4, 2017. ^ Alec Eden The search for Christian Doppler, Springer-Verlag, Wien 1992. Contains a facsimile edition with an English translation. ^ Becker (2011). Barbara J. Becker, Unravelling Starlight: William and Margaret Huggins and the Rise of the New Astronomy, illustrated Edition, Cambridge University Press, 2011; ISBN 110700229X, 9781107002296. ^ a b Rosen, Joe; Gothard, Lisa Quinn (2009). Encyclopedia of Physical Science. Infobase Publishing. p. 155. ISBN 978-0-8160-7011-4. ^ Strutt (Lord Rayleigh), John William (1896). MacMillan & Co (ed.). The Theory of Sound. 2 (2 ed.). Macmillan. p. 154. ^ The distinction is made clear in Harrison, Edward Robert (2000). Cosmology: The Science of the Universe (2nd ed.). Cambridge University Press. pp. 306ff. ISBN 978-0-521-66148-5. ^ An excellent review of the topic in technical detail is given here: Percival, Will; Samushia, Lado; Ross, Ashley; Shapiro, Charles; Raccanelli, Alvise (2011). "Review article: Redshift-space distortions" (PDF). Philosophical Transactions of the Royal Society. 369 (1957): 5058–67. Bibcode:2011RSPTA.369.5058P. doi:10.1098/rsta.2011.0370. PMID 22084293. ^ Wolff, Dipl.-Ing. (FH) Christian. "Radar Basics". www.radartutorial.eu. Retrieved 14 April 2018. ^ Davies, MJ; Newton, JD (2 July 2017). "Non-invasive imaging in cardiology for the generalist". British Journal of Hospital Medicine (London, England : 2005). 78 (7): 392–398. doi:10.12968/hmed.2017.78.7.392. PMID 28692375. ^ Appis, AW; Tracy, MJ; Feinstein, SB (1 June 2015). "Update on the safety and efficacy of commercial ultrasound contrast agents in cardiac applications". Echo Research and Practice. 2 (2): R55–62. doi:10.1530/ERP-15-0018. PMC 4676450. PMID 26693339. ^ Arndt, D. (2015). On Channel Modelling for Land Mobile Satellite Reception (Doctoral dissertation). ^ "Doppler shift is seen in reverse". Physics World. 10 March 2011. Doppler, C. (1842). Über das farbige Licht der Doppelsterne und einiger anderer Gestirne des Himmels (About the coloured light of the binary stars and some other stars of the heavens). Publisher: Abhandlungen der Königl. Böhm. Gesellschaft der Wissenschaften (V. Folge, Bd. 2, S. 465–482) [Proceedings of the Royal Bohemian Society of Sciences (Part V, Vol 2)]; Prague: 1842 (Reissued 1903). Some sources mention 1843 as year of publication because in that year the article was published in the Proceedings of the Bohemian Society of Sciences. Doppler himself referred to the publication as "Prag 1842 bei Borrosch und André", because in 1842 he had a preliminary edition printed that he distributed independently. "Doppler and the Doppler effect", E. N. da C. Andrade, Endeavour Vol. XVIII No. 69, January 1959 (published by ICI London). Historical account of Doppler's original paper and subsequent developments. Adrian, Eleni (24 June 1995). "Doppler Effect". NCSA. Retrieved 2008-07-13.